Silverberg, Robert. Up the Line . Ballantine 1973. Silverberg, Robert. 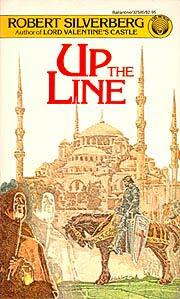 Up the Line . Ballantine/Del Rey 1985. Summary: A time tour guide gets in trouble. Basically non-allohistorical, but the result of assassinating Jesus at age 11 is briefly described. Comments: Follow-ups include Baron's Glory's End , Kingston's Caesar's Time Legions , Doyle and Macdonald's Timecrime, Inc. , and Wu's The Robin Hood Ambush . Published: Ballantine 1969, 1973 (0345234456), 1981 (0345296966), Ballantine/Del Rey 1985 (0345325850), Gollancz 1987 (0575040386); and ibooks 2002 (0743444973BUY). Translation: Czech by Petr Kotrle as Proti proudu casu , Navrat 1992 (8085432404). Translation: Nederlands by Ruud Bal as Rijders van de Tijdwind , Gradivus 1977 (906317571X). Translation: French by Henry-Luc Planchet as Les Temps parallègles: roman , Marabout 1976; Livre de Poche 2006 (225311331X). Translation: German by Tony Westermayr as Zeitpatrouille , Goldmann 1971, 1978 (3442231256). Translation: Italian by Roberta Rambelli as Il paradosso del passato , Nord 1978 (884290080X). Translation: Italian by Delio Zinoni Rambelli as Il paradosso del passato , Mondadori 1994. Translation: Portuguese by Abel Coimbra as Os Correios do Tempo , Livros do Brasil 1993. Translation: Swedish by Inge R.L. Larsson as Tidsströmmen , Kindberg 1979 (9185668095). 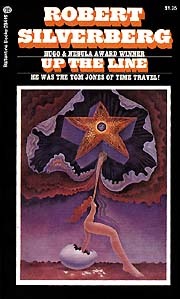 Awards: Nominee: 1970 Hugo for best novel.